The war in Yemen is far more than just a political struggle. As air raids continue to batter the Arab world’s poorest state, many Yemenis fear the country’s deepening divisions will inflict irreparable damage to its soul. In Sana’a, many families had fled the city, which has been hit by fuel and food shortages, the prices of some basic staples such as wheat have more than doubled. The attacks on health workers mean that fewer can reach besieged areas, and families of the wounded are less willing to transport their loved ones for treatment at the risk of being targeted. “This is really, really worrying,” said Dounia Dekhili, who is coordinating Médecins Sans Frontières activities in Yemen. Dekhili said it was difficult to support clinics operating in besieged areas, where medics have not been sleeping for days and morgues are quickly filling up. She said that just as states have been able to evacuate their diplomats, humanitarian aid should be permitted to reach the affected areas. The formula of this supposedly interim government under Hadi devastated the country within the first few months of its enforcement, it was the violent austerity such economic policies imposed on Yemeni people that has animated the resistance to globalism (and thus the endurance of the war). Crucially, what Yemen’s people revolted against in 2010-2011, and again in 2014, were the kinds of austerity and structural adjustments that were also recently made on Greece. As elsewhere in the world, IMF-imposed austerity hurt the poorest of Yemen’s population, whose suffering matched those of Egypt’s and Tunisia’s masses prior to 2011. The numbers of victims of what must be seen as globalism’s war are staggering. More than 63,000 children died in 2016 alone (the last year UNICEF dared to count). 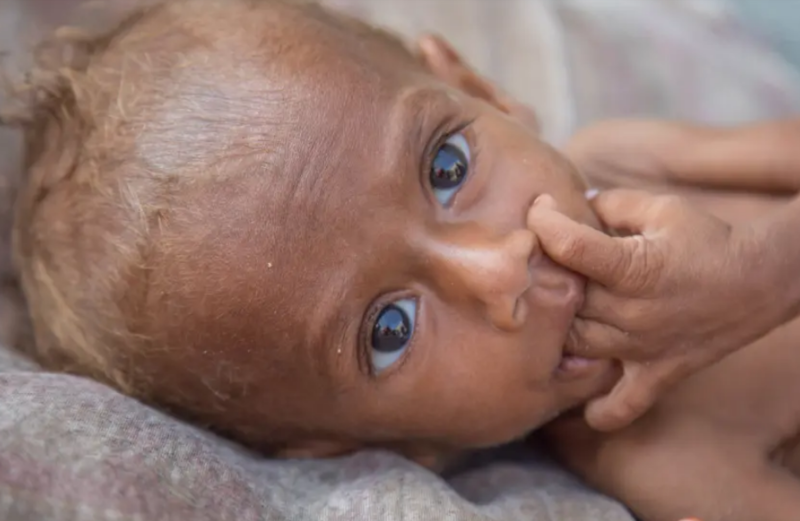 According to a September 21st report to the United Nations produced by the UN’s Office of the Coordination of Humanitarian Affairs, as of 2018, 18 million people are food insecure and 8 million are “severely” food insecure in Yemen. On top of this starvation, the outbreak of cholera in the war-torn country is likely the worst in human history. In other words, Yemen constitutes the world’s largest humanitarian disaster that receives little to no media coverage. In fact, the first week of the bombing campaign that started in March 2015, was already a window into the criminal intent of the American-maintained Qatari and Saudi jets. Targeting food storage facilities, farms, food processing plants, water tanks and bridges, the aim was no doubt to put pressure on the millions of civilian Yemenis and accomplish what the former ambassador’s threats did not. Ever since the 1990s, the global economy has incrementally shifted. The petrodollar, once enabling the American Empire to finance endless wars, has been undermined by a growing crisis in liquidity. The resulting desperate search for new sources of capital animates the globalists’ drive to violently subdue the Middle East today. On 9 August, the US-backed Saudi-led coalition aggression waging war in Yemen against Houthis dropped a bomb on a school bus packed with children. According to reports, the excited kids had been on a school trip marking the end of their summer classes, and as they passed a busy marketplace, the bomb directly hit their vehicle. The results were horrific. Of the 54 people killed, 44 were children, with most between the ages of six ando 11. The pictures of the dead and injured children, some of whom can be seen wearing their blue Unicef backpacks, are beyond heartbreaking. Undoubtedly. For one thing, these latest bombings are hardly the only times the Saudi-led coalition has killed civilians from the air. An independent monitoring group, the Yemen Data Project, found that there have been 55 airstrikes against civilian vehicles and buses in the first seven months of this year alone, and that of the 18,000 airstrikes between March 2015 to April 2018, almost a third (31%) of the targets were non-military (either civilians or civilian infrastructure) and another 33% of the strikes were classified as having unknown targets. That’s 64% of the strikes that could not be determined as having clear military targets. As of March 2017, an estimated 18.8 million people – 69% of Yemen’s population – needed some kind of humanitarian or protection assistance, according to the UN Office for the Co-ordination of Humanitarian Affairs (OCHA). That includes 10.3 million in acute need, who urgently require immediate, life-saving assistance in at least one sector. Some 3.3 million people have been displaced since March 2015. As of January 2017, more than 2 million remained displaced – more than six times the number recorded at the end of 2014 – and one million had returned to their homes. An additional 180,000 have fled the country. The reality is that the war has created the world’s worst humanitarian catastrophe today. Three-quarters of the population, some 22 million Yemenis, require humanitarian assistance and protection. About 8.4 million people hang on the brink of starvation and another 7 million lie malnourished.